legally. But, of course, he can do it illegally." A she previously called out ICC and challenged them to visit Philippines and investigate the stinks of death in President Duterte's campaign on war on drugs. 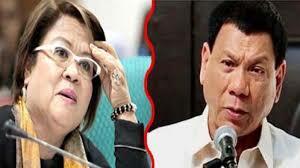 According to De Lima that the force to stop the drug deal and trade turned out a massive killings of 20,000 human beings victims-casualties without due process. "This is the behavior of a guilty criminal, not of an innocent person," further criticized Duterte. She added that the withdrawal to ICC and hampering and threatened investigators to conduct probe in EJK is a signal that he guilty of the allegations and accusation over his failure campaign an attempt to stop rampant drug trade in the country.